Fashion &Stylsh, Reusable&Waterproof , High quality －A trim and attractive design. 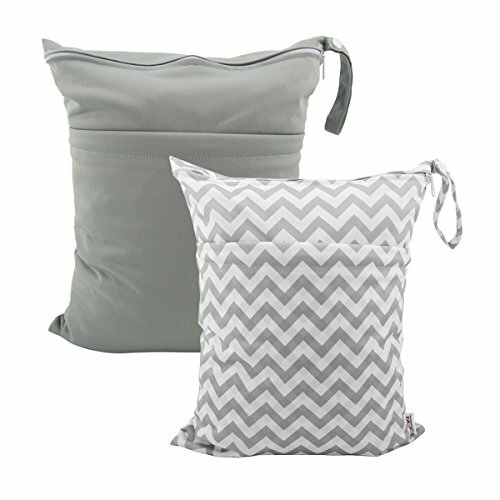 ALVABABY wet/dry bag are made from waterproof 100% polyester, put dirty cloth diapers in a wet bag. Comes with handle for easy carrying or attaching to your diaper bag or stroller. Double Zippered － TWO Zippered compartments for keep wet and dry things separate. Each bag contains a "wet" section that is sewn and sealed for no wicking or leaking. Enough Space－30cm x 36cm (approx. :11.5 in x 14 in)，Holds approximately 5-7 cloth diapers. Light weight, easy to carry (less than 50 g). Multi-functional Bags－A truly wonderful bag that allows you to carry your wet and dry items in the same bag. Carry all your items in one bag while keeping your dry items dry and your wet or soiled items separate. Truly an all in one bag! They can be used as diaper wet dry bags,travel bags,storage bags,cosmetic bags,handbags,wash bags,handbags,wash bags,organizer bags. Sincere Service&No Risk －1 year guarantee. If you have any problem with the product, please feel free to contact us, we'll send you a new one or refund your money of your choice.